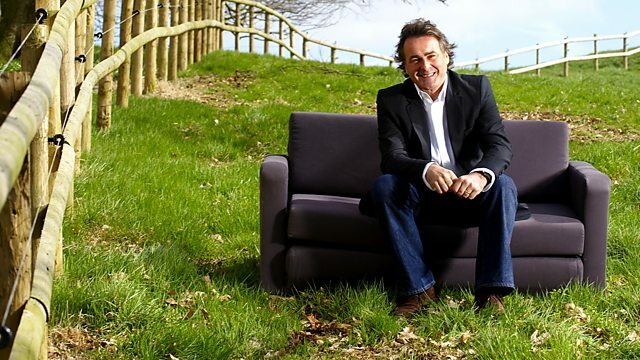 Swindon ‹ Series 7 ‹ Flog It! Paul Martin is joined by experts David Barby and Will Axon in Swindon. Paul takes time out to explore the Science Museum's oversized store in neighbouring Wroughton. Browse content similar to Swindon. Check below for episodes and series from the same categories and more! It's full steam ahead, as "Flog It!" has pulled into Swindon for today's valuations. is part of the former Swindon Railway Works. And it was right here, in 1960, that the last British mainline steam locomotive was built. And she was called Evening Star. Lights, all around us, on. Experts David Barby and Will Axon. But clearly there's something missing. And now the hall is full of day-trippers, we can get started with the valuations! Making a fast track to the table is Will Axon. Dawn, this is a really good old-fashioned toy. -This is when toys were toys, isn't it? Now, how did you come by this? Um, I was either nine or ten, and it was a Christmas present from my parents. It's perhaps a bit of a boy's toy, perhaps, don't you think? I think it is more, but I played with it for so many hours, building my dream home. -You enjoyed playing with it obviously. We can see from the box, one of the first things that strikes you with toys is condition. -I mean, we've got the box here, which is a little bit tattered. It's a little bit frayed. There's a bit of Sellotape that's kept the label on, and so on. -But you've played with it. It's been well loved and well used, and that's what these things were made for. -When it comes to value, that is a factor we have to take into consideration. Now, we've got it here laid out on the table. Bayko, it's not a firm that I've heard of, actually. which was the market leader in this sort of construction toy. But Bayko... Made out of plastic. You've got all the pieces here. Now it comes down to value. You got any idea? What do you think? I have no idea, honestly. Nobody has ever heard of it, so I don't know. It's a little bit, from my point of view, an unknown quantity. My suggestion to you would be to put it in the sale and just let it make what it makes. Happy with that? -Yes, because I do want to sell it. is to just let the market decide what the value is. It might be £20 or £30. we're definitely going to get it away for you. OK, then. Thank you very much indeed. Thank you. Mervyn, I find this particular book absolutely fascinating. -Well, originally it belonged to my uncle. And he recently passed away, and I had the job of clearing his house out, and I came across it. I thought it would probably be of some value or some interest to somebody. -But you can't tell me who they are. -That's not very good, Mervyn! is interesting, because all of these designs are by an artist called Caton Woodville. illustrations people would put on the wall in frames, and also postcards. So he was quite a well-known artist. -the colour illustrations with apertures to put photographs. Now, the emphasis on this album is military. Military and naval. -So, did your family have any connections with the military or navy? was in the military sort of thing. Army etc. Right. Now, looking at the photographs, they're all of a very affluent society. And we're looking at the latter part of the Victorian period. Crimean War period, particularly the army uniforms here. So, is your background from a sort of wealthy background, upper-middle class? Well, this strikes a chord with these. they're all of very well-to-do people of the late Victorian period. Beautifully dressed. And this is one of the reasons why people buy these albums because of the costume detail. And if we look at this one here, this one looks to be a captain. -Aren't you fascinated by this? I love looking at these photographs because it's looking at other people's lives. When we look at... This one is absolutely intriguing. Can you see what it is? It's a plantation. We've got maybe the owners of the plantation with all the workforce all the way round. That's intriguing. And that alone will be a valuable photograph on its own. -You want to sell this? We've got to project a price that's going to be appealing for people to buy it. And I would have thought round about 100 to 120, that sort of price range. But I'm going to suggest we put the reserve at 80. Let's hope we get a high price for you and you can do what you want with the money. -Thank you very much for coming along. Eleanor, this has certainly brightened up the afternoon for me. This wonderful hand-embroidered silk shawl or throw. Is it something that you've inherited or is it something you bought along the way? -I bought it at a jumble sale. There seemed to be some very good jumble sales in this area. What sort of money did you have to part with? It would have been pennies rather than shillings. It was that sort of stage, where everything goes for 5p or 10p. -Towards the end, when no-one wants to take anything home. -What to say about it? I mean, obviously it's silk. silk threads, and beautiful floral sprays here with these exotic birds. And then you've got this lovely lattice-worked border, with the tassels. It's probably going to date from, I'd guess, around late 19th early 20th century. it would have been impossible to wear them in our climate. That's where the shawl originated. Have you worn it yourself, or is it on display at home? I've never worn it, and it's never been used for display. I bought it for the children to use to put into their dressing up box. -Has it got good use from them? -Absolutely. Four children have had to wear it on many occasions. None of them liked it, but it's been very useful. -And it's a decent size, as well. And it's got some weight to it, when you pick it up because of the density of this lattice border. What sort of figure... You said you paid for it would be pence - is that right? -So we're not in any danger of you having to perhaps make a loss on this? -and I'd suggest an estimate of perhaps around £60 to £80. -You're not afraid to have it back if it doesn't sell? So we'll put £60 on it as a reserve. If it doesn't sell at £60, perhaps put it in the toy box, waiting for the grandchildren to arrive. -So, £60 to £80. £60 reserve. And we'll get it away for you on the day. Fingers crossed. That's good. Excellent. Thank you. I could imagine your bedroom, or maybe the attic, all set out with a railway track. The attic in our bungalow was one mass railway track. there is this massive wood and above it would be track and then trains. and you heard this hum of electric current as it was going round. You could hear it downstairs. You could tell a train was going. You couldn't see it but just the noise. So, why are you parting with these? and I don't really have much interest in the trains. They were passed on to me and my brother and I saw "Flog It!" recently advertised in local papers and thought, come and see if I could sell any of them. So, they don't have any sort of sentimental attachment. -They're not as though you had them when you were a child. It was more, you can look but don't touch. Right! What I find with this particular group is that they're all in such good condition. And, they've been maintained, on the whole in their original boxes. Which is so important when you're selling toys - probably that's the wrong word to use - toys. It's more of an adult toy. I do like these trains - particularly the Mallard here. Yes. Everybody's heard of the Mallard. And that wonderful, streamlined front. I think it's still got the record for the highest speed in the world for a steam train. This is perfectly correct. And then you have the Nigel Cresley here. -What's the one right at the very front? -That is the Duchess of Montrose. -And then you have standard locos. -How many trains have you got? -I think I've got about eight here. -You're wanting to sell these. When it comes to the actual value, I think they're quite speculative. I only hope that we get the collectors in that room. If we do, the price can be something in the region of £400 to £500, if not more. -We shall do our very best for you. -Hopefully, it will be nice. I will keep some. I'm not going to get rid of all of them. I'll keep one or two with the tracks saying, "That's what my father had." -All these on the table now are to be sold. -I'm quite happy for all these to go. -Peter, thank you very much for coming along. -this quite splendid array of... How many did you say there were? -50 silver ingots, sterling silver. -Solid sterling silver ingots, which commemorate a wide variety of locomotives. Well, my wife had a second-hand dealership and somebody came in and obviously she was interested. -What did she pay for them? -Oh, under £100, I think. -So under £100, which is good going considering the value of silver at the moment. -Date-wise, they're from the 1970s. Were these collected over a period of time? -50 months. One a month. -Right. So it was one a month. 50 months. -And, we've got here the original receipt. £11.25. That was each, which I suppose in the '70s was a decent bit of money, wasn't it? -Quite a bit of money, I'd say. saying that it is the National Railway Museum Collection. -So these were produced to commemorate the opening of the museum. -like the Rocket and the Flying Scotsman. But looking down here, there's one... There it is, the Evening Star. That's quite poignant, as that was the last steam loco made. -It was, yes. In here. -In here, in the 1960s. So, again, bearing in mind where we are, it really sort of hits the right note. -but, what it's got going for it is that they are solid sterling. Have you got any idea of what sort of figure they should be valued at? Have you thought about it, at all? Well, scrap price... I mean, probably around £5. Is it around £5, £6 an ounce? Yes. Cos I think you said they were an ounce each? -They're an ounce each. Yep. -So each ingot is an ounce. We've got 50, so 50 ounces, obviously. -Say a fiver for an ounce. -And at scrap value, we're looking at around, sort of, 250. But at least then we know it can only go up from there, value-wise. -So what I would suggest was, if we could value these at perhaps £200 to £300. What do you think? -You think we'll go for that? -will be doing their own maths and working out what it is worth scrap. Well, I'm happy to give these a go at £200 to £300, if you're happy to go with that. -And, reserve it at a couple of hundred, do you think? -I want to reserve it. Yeah. At least 200. -OK. Hopefully on the day, we'll get it away for you. Now I reckon I've been to hundreds of antique auctions in my life. I know how they work, but today I'm doing something completely different. to find out what it's like to be a buyer, a seller and an auctioneer. and has twice-weekly sales and most breeds of farm animals. I'm going to learn how it all works from one of the auctioneers, John Pullen. -These are continental cross cattle. -They would be beef breeds. These will go into the food chain. Someone's just put dobs of grease on their back. What's that for? We put lot numbers on the back, as you do in the antiques world. Keep the lots numbered! Couldn't do that with antiques! Every beast has a lot number on its back which must match up with a passport. These are very important in our industry. You can't move cattle without one of these? -and where it's going, ultimately. -You still haven't told me your estimate! I guess she's a good beast, so she's going to be, hopefully, 750 to £800. -Will you get that today, do you think? -I'd like to hope so. I hope you do, as well! -What are your commission charges? but we're probably going to earn about 15 to £17 for selling that beast today. -That's not a lot, is it? in the antiques world, most auction houses are charging 17 to 20% commission to the buyer. -And also to the seller. -We're in the wrong trade. -We're working on 2, 2.5%. I've got to say, looking around, I mean, the auction's not far off starting. I can't see a lot of bidders. How many people do you expect turning up? We don't unfortunately get the numbers you get randomly turning up to your antiques. On average, what do you expect? -Probably five or six bidders on the sheep. -And five or six bidders on the cattle. -We've got our work cut out. -So you've got to make them fight amongst each other. Which is difficult as they all know each other! It's typical. All the bidders turned up in the nick of time. I think they were in the cafe all along. That is so typical of auction rooms. Welcome to Cirencester. My pleasure to say they're cheaper than normal. Green lines are farm assured. Blue lines, non-farm assured. Red market today. On we go, gentlemen, 42 kilos, then. So quick, I can't even see the bidding going on. He's just sold that pen off. What does that work out per kilo, per sheep and also, per pen? -Well, about 130 pence a kilo for those lambs in there. They come to £64 per head. There was ten in the pen so we've made £640 from that pen of sheep. OK. £64 per sheep. That's not bad. and the farmer needs to earn a living and he needs top money. -Peter, these are yours, aren't they? And they're about 25 months old. -How many of those have you got? -In total, we have 550 in two counties. They're such an affectionate animal, the Belgian Blue. And that's why I choose them now to farm, because they're slower in energy. Whereas the Limousins are a very high energy animal, and I can't run fast enough to keep up with them! -so they'll be coming in a minute. Is it Chris on the rostrum? -Chris is coming back on the rostrum. Do you know, I can't understand him at all! 510 kilos, gentlemen. 510 kilos coming in. How many sales a year do you have? -We're in here twice a week. -Every week. Two sales a week. Bar Christmas week. Every other week of the year. And is it just sheep and cattle, or do you do pigs? -We do sheep, cattle, pigs. and goats in here. -What's your favourite bit of the job? The adrenalin of a sale. It's a real buzz and we all enjoy that. I'm looking forward to getting back to the antiques world. so now it's time for our first trip to the auction room. Let's find out what lots we've got. hours of building fun. What a lovely lot this is! but not anyone that Mervyn recognises. So, it's time to let them go. Is this the end of the dressing up for Eleanor and her kids? That pretty shawl goes under the hammer. If Peter's trains sell well, I hope he's going to be chuffed to bits. And lastly, there's Chas's collection of silver ingot locomotives. Let's hope they build up a head of steam among the bidders! So, where is today's auction destination? because we're at the Cotswolds Auction Company. This lot behind me are here to buy. It seems auctioneer Elizabeth Paul has something to tell us about Peter's trains. -with their boxes but I haven't got anything in that condition. These belonged to Peter - they were his father's. -The message was, "Look, but do not touch". and the packaging and boxing which is just right of £400 to £500 with a fixed reserve of 350. Why? It looks about right to me. -We had his second look and this one alone could make 250, 300. Just that one. Just probably a bit rarer, nice box, pristine condition. I doubt it's ever run. Are you going to split this lot? It's staying together. And there's been a lot of interest. -And now the reserve is? What are you hoping to get? On a good day, fingers crossed. This is a bit of fun. Dawn's Bayko construction kit. -What value have you got on this? 50, 40? -No, less than that actually. We put it in at 20, 30. It is a poor man's Meccano. -In the collector's world. That's what I'm saying. -I'm not saying it is any less fun or any less taxing. -Dawn, you've had this in long, long time. -You played with it as a young girl. -You can't pass it on to anyone? -You can't divide between three, can you? You can't let anyone play with it really. It's not safe. With the little ones - screws - it's not safe. -Does it bring back lots of memories? -Oh, it does. Yeah, loved it. Oh, we could have tears, we could have tears. And you've been doing a bit of research. A friend did. The Bayko club is celebrating 75 years next year. That might help the price. Anniversaries always bunk the price up. -Well, nobody had heard of it. -It depends how many people know about it as well. OK, 122. Bayko building set - number two. A nice lot. Start me at £10. £10 to start. Five then. £5 anywhere. Five I'm bid. 12. 15. At £15 with the gentleman. -What else can we do? You will get a coffee by the time they have taken off the commission. You've got a sandwich and a coffee. -But it's been good fun being on "Flog It!" -That's what it is about. Mervyn's photographs, Caton Woodville, these are absolutely lovely. A lot of family history here. David, you've put about £100 to £120 on them. Yes, basically, it's a military interest. Also, the artist that did the lithograph plates, absolutely superb. So, you've got two combinations. Military photographs, family history, all the way through. which is going to help these hopefully fly away. Lots of family history here. Your family history - your social history. Why is he flogging them? That's what we want to know. Well, I got to the age where money is more important than everything else. -Well, I'm just coming up to 75 now. -That's not old this day and age, is it? With all these drugs going, they can keep your alive till you're 100. Now we know where the money's going! Hopefully, you'll have one of those after the sale. We're going to find out right now because it's going under the hammer. Victorian army and navy photograph album. There it is. Put it in, £50. Who'll give me 50? 30 then. £30. Nobody wants it? 30 bid. At 30. At 35. 50. 5. 60. 5. 70. 5. At 85 on my right, at 85. At 85. Any advance, 90? At 90. The gentleman's bid now at 90. Are we all done? Seated now, at £90 with the gentleman. Yes, the hammer's gone down. £90. We had a reserve but it just tucked it in there. Problem is, drinking and driving. You've got to go home first. Go to the local boozer. Right now, it's the shawl. We've got £60 to £80 on this. Put on by our expert, Will. -Eleanor, you've had this 30 years. -I don't need it any more. It takes up space. The children played with it for years and I don't need it. OK, we've got a reserve. With a bit of discretion at 60. You're not giving us away. I think for quality of the shawl, a nice silk, hand-embroidered. It's got to be worth £50 to £55. So, fingers crossed, like you say, a few ladies in the room. I reckon it's going to go. -Someone will go home wearing this. -A rather lovely fringed and bordered silk shawl. Centre embroidered with exotic birds. A very lovely thing. £50. Start me off somewhere. 30 then. Come on, it's cheap at 30. 30, I'm bid. At 30. At 35. At 35, any advance? At 35, are will done then? At 35. It seems to be struggling a bit here. It didn't sell. You did the right thing. You protected it with a reserve, that's the main thing. At £30, £35, it's worth holding on to. -Just for a bit longer. Maybe use it again for dressing up - let the grand kids use it next time. -If you do want to sell it, I suggest putting it into a textiles sale. This is the only item of textiles here. -It's out on a limb really. Well, we're steaming along now. We should be after this lot. It is the Hornby trains. There's a lot of locomotives. They belong to Peter. We had a valuation of £400 to £500. Since that valuation day, you've had a chat with the auctioneer. -the price has gone up. -Yes, there was an electric diesel. We did talk about it on the day. That's worth a bit more. That's why we've actually upped the reserve price. -What did you put the reserve up to? And the auction house is agreeable to that? -We could be looking at sort of £600, £700 now. -It would be very, very good. It's full steam ahead. Let's find out. -Let's hope there are buyers here, Paul. rolling-stock and track - including electric motor coach. A very nice lot. Lots and lots of interest. Start me at 200. 200, I'm bid. Thank you. At 200. At 200, who's going on? 220. 250. 550. At 550 now, are we all done? Yes. Not bad. The hammer's gone down. -That's good. We'll settle for that. This is interesting. 50 silver ingots just about to go under the hammer. They belong to Chas. He can't be with us right now. He's at work in Manchester, but we do have Donna, his wife. 200 to £300. What do you think? so, you know, they should make that money. They're an ounce a go. 50 of them. Fingers crossed. Silver ingot collection. 50 in the box. In a fitted case. Start me at £100. £100 bid. Selling at 290. Gentleman's bid. Yes! £290! That's brilliant, isn't it? You were feeling so nervous! You got me worried there. -But good job the scrap value is worth £200. Hopefully they won't be scrapped. -Hopefully someone will keep them as a part of a collection. that I see, which most people rarely get a chance to. Today, I'm doing just that. the Science Museum houses all its oversized objects in six big aircraft hangars, like this one. from nuclear missiles to the Blue Peter lifeboat. Each item comes with its own unique story. Peter Turvey, pleasure to meet you. You're the head curator here. -So you're the person to tell me how many items does this place house? We have about 18,000 museum objects here at Science Museum, Swindon. You're responsible responsible for all of them? for making them safe and well looked after. What about the history of this place, though, prior to when you got hold of it? This was a World War II airfield. It was a maintenance unit, Number 15 maintenance unit. All the buildings were built before the outbreak of the Second World War. and then we gradually took it over for museum storage. It's difficult, because I've so many things to look at. I've got lots of different favourites depending on what day it is! I think my favourite at the moment is our steam car. Maybe we'll have a look at that a bit later! the oldest item here or the largest or the heaviest. What have you got to show me? We could look at our Fleet Street printing press, the heaviest object we've got at 140 tons. -OK. Is it this way? Where is it then, Peter? I'm being a bit cheeky, because I know we've just walked through it or underneath it. That is colossal. -An impressive piece of machinery. -It's as big as a house, isn't it? Yes. Actually, we only have one third of it here. It was bigger! Wow, gosh! Obviously, you had to assemble it here, it came in bits. and skilled engineers spent nine weeks putting it together here. -What date is that? When was it decommissioned? and it was in use printing the Daily Mail and the Evening News until about 1989. Incredible! Do you know roughly how it worked? -Yes. It's quite simple. See that big roll of newsprint there? That was fed up through the machine up to all those rollers. Some of the rollers have the type face for printing the newspaper. Some carry ink onto the type face. and it's folded and turned into bits of newspaper, and then shot off elsewhere into the building. -You could say that is a Fleet Street heavyweight. -Keeps you fit, walking around. -Yes. It's a big site. One big giant attic and everything is in juxtaposition. It's quite interesting. I can just see, you've got the Sno-Cat here next to an old bus. -Everything is organised according to size and weight. -Tell me about the Sno-Cat. This is really one of our star objects. It's got an amazing history with it. for a British expedition that was the first motorised crossing of Antarctica. They set off in late-1957 and got to the other side in early-1958. It was a very important scientific expedition. Some of the research they did is very relevant today. -so we can actually see how global warming has affected the ice sheet. I can see how it works now. It's got four pontoons as wheels, with tracks on it. so they spread the weight so they can go over snowfields. and make sure they aren't rusting any further. Yes. We have a specialist team of conservators who look after our objects. If you go over to our conservation laboratory you can meet Dennis, who's one of our conservators. and he's been showing me around. I want to find out a bit more about conservation. Where do you start? What do you pick on? down at the Science Museum in London, so we don't do any repairs. -Conservation isn't about making it work. -This is a computer, isn't it? Actually, this is ERNIE I. He picked the Premium Bond numbers. Yeah, that's right. Back in the 1950s. The acronym ERNIE stands for Electronic Random Number Indicator Equipment. From 1957 to 1972, ERNIE I produced thousands upon thousands of winning numbers for the premium bonds. Today, ERNIE IV does the job and ERNIE I has been saved as a museum piece. What are you doing? I see you're using traditional methods and techniques. It's like you're restoring a little bit of fine art on a canvas. and we've found that the enzymes in saliva are one of the most effective ways of cleaning it. -Not all YOUR saliva, though. -I have to think about lemons a lot. -You're going to be here for months. -Yes, it's quite a bit bigger. I'm not doing all the surfaces. We've booked in six months to do it and that's going to be pushing it. but I know you've got your work cut out so I'll let you get on with it. but it's only open to the general public on certain days of the year. Do keep an eye open, because there's plenty to see here and they are preserving your heritage. It's back to the valuation day and David looks like a very happy man. Judy, this is such a remarkable piece of porcelain. for many years and I was often told how very valuable it was. so I'd like to find something that I can replace it with. I think it's very good indeed. -this is the top end of the early-20th century porcelain market. This is the sort of choice porcelain that would have been in the rather splendid Edwardian cabinets. Produced not necessarily for usage. No, I was wondering what it might be used for, actually. The nearest thing you could get for table usage would be bonbons. that would have been made in the kitchen, below stairs. Otherwise, they might have had candied fruit or something like that. But this is a highly decorative piece. If you look at it carefully and squint at it it almost looks like a Renaissance goblet. -It is very, very fine Worcester porcelain. Now, just tell me, why are you selling this? It's not something that I look at and think, "Isn't that gorgeous?" I'd like something that I'll look at and think, "Isn't that gorgeous?" -What I like about it is its sheer opulence. It's the amount of gilt that is used. This wonderful floral painting and if you look at the floral painting, its outlined in gilt as well. I love these scroll handles which you'd hold. It's almost a drinking vessel. something like that. You are looking back to the past for the inspiration of design. Now, these were produced at end of the 19th, into the 20th century. This piece has a mark on the bottom which will tell me the exact date it was made. The beauty of Worcester porcelain is, it's exactly like silver marks. You can tell the exact year that this was made by the dots underneath. Now, the dots start in 1892. -And if you count up all the other dots, it works out to 1911. -So, this piece was made in 1911. -That glorious epoch of the early- 20th century. The Edwardian ladies. My Fair Lady. -Yes. That's where the opulence comes from, yes, yes. These are still in demand. -But not as much as they were five or even 10 years ago. five years ago, would have been 150 to £200. That sort of price range. to go for this blush ground. Fashions change. I never understand why. If we are looking at this, around about 100 to 130. -If it goes for more, I shall be very happy. Yes. Well, so shall I! Thank you very much for coming along. I do appreciate it. I hope we make a very good price for you. Well, look at this lay-out we've got on the table here, Adrian. This is taking me back to my childhood. Were these yours as a child? Did you play with these? They were my father-in-law's. He collected them in the '70s. They were just put in a case by all accounts. And when he passed away, he left them to the wife. So, this is how we've come to get them and they've been in the loft for six years. It's amazing, he didn't open these, did he? Was he buying these for investment, do you think? He just liked collecting the cars. But he never let the children play with them. Well, as you can see, from here, the majority of these are Matchbox. Corgi and Dinky and then third in that tier comes Matchbox. You've got quite an array that you've brought with you today, Adrian. This one is fairly out here, the GWR. Bearing in mind where we are today, then we've got another loco here. the television programmes I used to watch as a small boy. -Any particular favourites of yours, here? -I used to watch that in the '70s. doesn't it? Well, that's a Corgi one, as is the James Bond ones. Now, that was a bandwagon that a lot of them jumped on. That would open up the market to a whole new collector, shall we say? They tend to be well collected. -have you any idea of what they might be worth? certainly the ones that have been kept in the packaging. That's a premium that's hard to get. It means they're mint condition. I've had a quick tot up. I don't know how many there are here. My suggestion, to put them into the auction, would be perhaps put an estimate on of £40 to £60. Straddle that £50-mark. And see how they do on the day. Were you thinking of putting a reserve on them? Your wife inherited them - you have permission to sell these? -We've got her permission to sell. If we say no reserve, we're going to get a sale on the day. That's what it's about at the end of the day. and have a great nostalgic play with them, what do you think? -Excellent. So, we'll see you on the day? -Yeah, that's fine. Thank you. Well, Diane, this is absolutely devastating. It's one of the most exciting things that's been brought in today. Well, we've always thought it was a visitor's card case. That's perfectly correct. Have you seen one like this before? -Not so much decoration on it. but it's also raised work, as well. so you've got all this lovely open work here on a matt ground. is the decoration in the centre panel here, which is of a house. Do you know what the house is? No. No. We would like to know. -because it commemorates two major writers of the day. -Who lived at Abbotsford? Sir Walter Scott. Who lived at Newstead Abbey? -two major literary figures of the early 19th century. Now, when I say early 19th century, this little box dates from 1836. This was made in Birmingham by a company called Taylor and Perry. -It's lovely. Now, does this belong to you? So your father's instructed you to sell this on his behalf? -If the price is right. How much do you think it's worth yourself? Erm... Well, he did think, round about 200 to 300. 200 to 300. Well, I think he's got a sensible head on his shoulders. -Where he is now that you've had to come along? -He's actually on a half world cruise. Oh! Doesn't really need the money, does he? Oh, he's working though, on it. -He's a dance host for Saga. -What a fascinating way to see the world, isn't it? Oh, that's brilliant. Oh, that's brilliant, isn't it? we should get something in the region of about 400, £600. But the factors are the decoration and the subject matter. -So that's Newstead Abbey and Abbotsford. -and that is in perfect condition. so I think it'll make the top end of the price. Sandra, these two pictures are of real quality. I think they're very special. Will you tell me a bit about them? What do you know? Not very much. They were given to my father, when we lived in London. A customer gave them to him as a present. -To say thank you. And they've hung in our house ever since. -Do you know what they are? Not really. I thought they were painted on slate, but that's all. You're right about one thing. They are on slate. and they could have done a better job, because that's not painted on. That slate has been carved out and stone and marble has been inset into the aperture that's been carved out. hard durable stone. It's Italian and it's a very, very clever technique. The Italians were absolutely amazing at this. It's a technique that dates back to the Renaissance, the 1500s. Very expensive in their day, as well. The condition is absolutely beautiful. If I can just turn them over, you can see, both backs have not been tampered with. Original hanging rings and the original paper backing. Now, the trade are going to absolutely love that. Because it's not been fiddled with. But look at the quality of that. Lovely bold Victorian, ebonised frame. Wonderful gold inset. It just picks the whole thing out. But look at the stones you've got involved in there. There's black onyx, some lapis as well. There's bits of marble. Look at the trousers, the boots, that's a lovely marble. Isn't it beautiful? Why do you want to sell them? I don't think our house is suitable. It's a modern central-heated house and I think the central heating is spoiling them. Never hang anything like this over a radiator. Never hang anything obviously, a bit of fine art work, in a room with direct sunlight coming on to it. Have you any idea how much these are worth? -if two people fell in love with these, we could sell the pair for £600. -Would you be happy with that? Has that surprised you? I think it's a cracking lot and hopefully we'll have some eager bidding on this. Here are our second lot of items to go under the hammer. but there are plenty of people who love it, so let's hope they are in the saleroom today. This collection shouldn't be hidden away. It's great fun and could take a willing bidder on a very nostalgic trip down memory lane. and at £300 to £500, I'd be amazed if they're not snapped up. And last up is a silver card case. and told her to flog it. And taking the rostrum for this lot is auctioneer Lindsay Broom. including David. You put £100, £150 on it, it's fixed at £100. -Why don't you like it? -It's just a bit too much. I think it's very attractive. I can see the value of it. But it's just a bit too much. Is it? You like it a bit more simple things? More humble, bohemian? -Just something that's not quite so ornate. but it has got that richness you associate with the the Edwardian period. Again, that's antiques, in a way. Some of them have to be showy. That's what it's all about. -You want to show them off, otherwise it's not worth investing in them. OK, let's see who's going to invest in this one, shall we? Here we go. Lot 217, the Royal Worcester porcelain pedestal bowl. Very pretty one. What shall we say, £100 to start on this? £100? 50 then, £50 to start. It's a big jump, isn't it? Anyone interested at £50 to start? It's got to be £100! £100 for you... 100 bid, right at the back. Oh, we had a fixed reserve at 100. That was close, wasn't it? Sailing a bit close to the wind, there. -We did it. 100 quid. -We got the hundred. That's fine. Next up, Adrian's Matchbox cars. but his mum, Ruth, is here, flogging his cars. Well, we've got £40 to £60 put on these. I love the Kojak one and the old catchphrase was, "Who loves you, baby?" Let's see if someone falls in love with this one. Here it is. A quantity of Corgis and Matchbox die cast. Two boxes. £50 to start? 50 I'm bid, at 50. At 50.
who's going on then at 70? Any advance then at 70? 85, 90, any other buyers? 95.
are we all done at 110? Are we all finished at 110? Yes. Hammer's down at £110. £110. -He will be over the moon. -A result! Kojak did that with his lollipop! I know you've been waiting a long time for this one and so have we. It's that wonderful silver card case. 400 to £600. Beautiful work. Lovely embossed work. We were musing over it. The auctioneer and myself were just poring over it. It's absolutely divine. I hope we get that top end. It's the best thing in the sale! -OK. So what's the money going to? To him, but I hope he'll give me a commission! Yeah. Let's hope we get that top end. I'd like to see the 600. Victorian silver castle top card case. Very lovely piece here. Beautifully decorated. 300 to start. £300. Bid at 300. At 300 near me. -400. At 400 near me. -At 550, now, are we all done? At 550 near me, then. -I feel greedy. Come on...! -Dad's going to be over the moon, isn't he? -Yeah, when he gets back. -He's on a cruise at the moment. -On his way to Australia. Sounds like he doesn't need the money! -Sandra, what's going through your mind right now? a pair of pietra dura, in fact, look at this, they're right next to us, just there. Going under the hammer, we are two lots away, £300 to £500. I had a chat to the auctioneer before the sale. They sold a pair in a previous sale for £600 and the images were of birds. You've got these wonderful cavaliers. We're coming towards the end of the sale and the room has thinned out. or you never know, there might be a phone bid. -You won't bash me over their head, will you, if they don't sell? -No. They'll just go home again. OK. Good luck. They're going under the hammer, now. 331, pair of pietra dura pictures showing there. Very lovely. Start me off, lots and lots of interest. Start me at 300. 550, 580, at 580, 600. -At £600, any advance on £600? At £600, standing in the room now, are we all done? -That's what we talked about on the day, didn't we? We said, we'd pitch it at 300-500, but hopefully they'll make the £600. Phew. Pressure is off. What are you going to do with that £600? What's it going towards? A holiday. Everybody is spending their money on holidays. -Where is the holiday going to be? -Ooh, lovely, have you been there before? Nice peaceful two weeks, just sort of taking it easy. Yes. In a hotel this time, not a guest house. Thank you so much, Sandra. That was pure quality and quality always sells. I hope you've enjoyed today's show. We thoroughly enjoyed making it. So, until next time, it's cheerio from Cirencester. Paul Martin and the team steam in to Swindon to value the public's antiques with help from experts David Barby and Will Axon. Paul takes time out to explore the Science Museum's oversized store in neighbouring Wroughton.